This gift of Increased Rapture Chocolate Combo messages most gracefully your words of heart to your beloved and therein heightens the warmth in your relationship with your beloved. This is a thought-sugaring Combo of 1 Corazon Beloved Candy (1 Packet), Nestle Fox's Crystal Clear Mint Candy (1 Packet), Romansa Heart Compound Peanut Chocolates (3 Pcs. 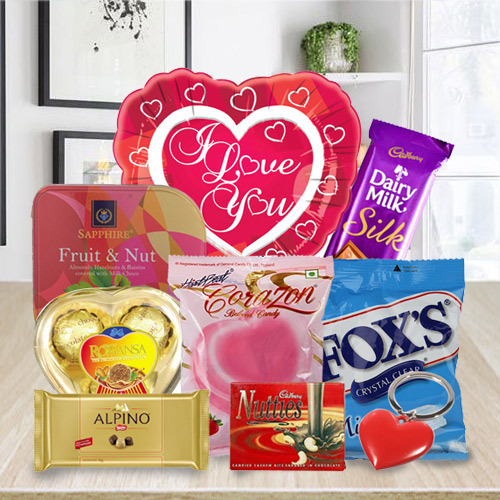 ), 1 Heart Shape Mylar Balloon, 1 Nestle Alpino Bar, Cadbury Dairy Milk Silk (1 Bar), 1 Heart Shaped Key Ring, 1 Box of Sapphire Fruit and Nut and 1 Box of Nutties.